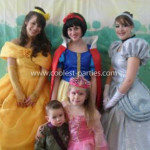 Here’s my son’s 7th birthday party. 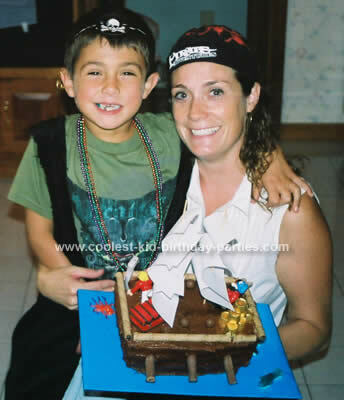 Enjoy our pirate birthday party ideas for your next party! For the invitations I soaked paper in coffee, dried them in the microwave, printed out the info onto the dry paper, burned the edges then painted cooking oil on them and let them dry. The end result looked and felt like a parchment. I then rolled them up tied them with raffia and mailed in a tube. 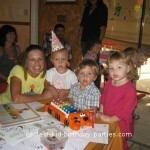 I always have 2 craft tables, one the kids decorated wooden treasure boxes with markers and stick on jewels. I also had saved paper towel tubes, spray painted them gold and the kids got to decorate those. On the other table I had black poster board glued onto wooden dowels and the kids decorated their “pirate flags” with special colored pencils (made to work on dark paper). I gave out parts of pirates costumes with each game we played. 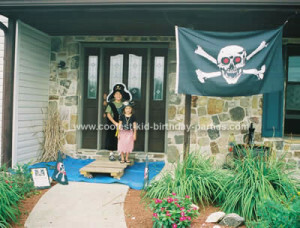 1) “Pin the patch on the pirate” and each child received a pirate eye patch. 2) “Pass the skull” (like hot potato – when the music stopped whoever was holding the skull was out) and each child received a skull bandana. 3) “Hook the jewels”. I made “hooks” by using a black plastic cup breaking off the hook of a white plastic hanger punched a hold into the end of the cup and inserted the hanger hook. I lined the kids up into 2 lines threw jewel necklaces all over and they had to race to “hook” the treasure and run over to the treasure box (a Styrofoam cooler painted gold with jewels glued on it). Each child got to keep their hook and also pick out 3 necklaces. 4) “Cannon ball pop”. Each child had a balloon attached to a string tied onto their leg. They then raced around the yard trying to pop everyone’s balloon but also keep theirs away from others. The kids received fake gross teeth for this game. Another one of my pirate birthday party ideas was a “treasure hunt” on our front yard. I had spray painted poker chips and marbles gold then thrown them all over the yard. 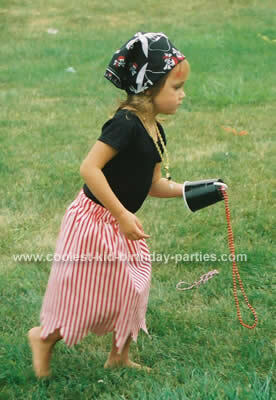 The kids used their “hooks” as cups and spent a good deal of time searching in the grass of the treasure. They got to keep what they found and also received a gold earring. 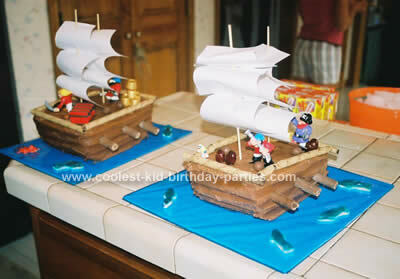 The cakes looked like pirate ships with gummy sharks swimming around. 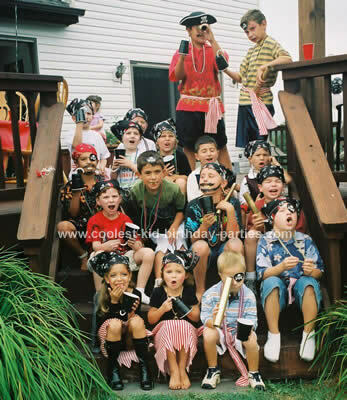 Most kids came with some sort of pirate costume so they all looked great. 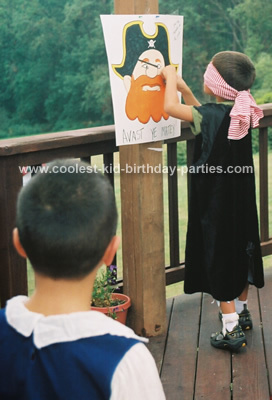 We had a lot of fun with all our pirate birthday party ideas!